Birds sighted: Collared dove, swallow, wood pigeon, black-headed gull, oystercatcher, reed bunting, meadow pipit, skylark, common tern, green finch, shag, curlew. 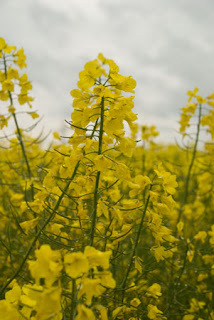 This morning was yet another of those drizzly mornings where everything gets wet but humans. 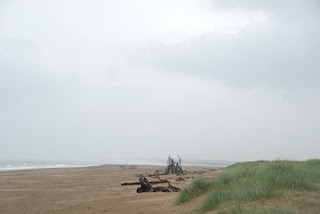 This Traveler drove on the left for the first time albeit only about a half mile down a one track road to the parking area for the St. Cyrus National Reserve, a long and beautiful dune and beach complex. 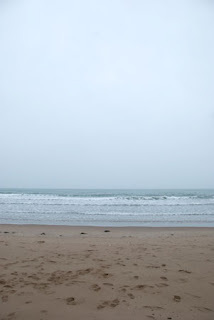 You'll have to take my word for it that this long and lonely looking beach is beautiful. My photos make it look like something out of an early Stanley Kubrick film. 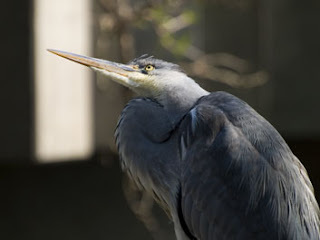 You'll just have to imagine that, if you were looking through binoculars out to sea, you would see terns hovering and diving in their hundreds and shags and other sea birds flying along the coast. Along the dunes we say plenty evidence of rabbits and the multi-colored Grove Snails who enjoyed feasting upon their feces. Skylarks and pipits were in evidence as were reed buntings. Our true object was to reach Pitlochry, our mid-point stop on our way to the western Highlands. On the way we stopped and investigated the Aberlemno Pictish Stones. Aberlemno is small village in Angus. It is noted for four large carved Pictish stones dating from the 7th and 8th centuries. Three stones stand by the B9134 Forfar-Brechin road, the Kirkyard Stone stands in the nearby graveyard of the parish church. Who were the Picts? Roman sources, dating from the 4th century, refer to the people of northern Scotland as “Picts”. 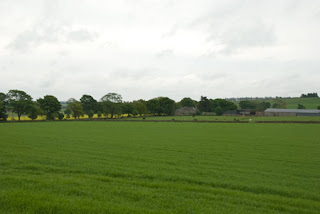 The Picts, leaving no written records, left us in the dark about much of their history and what we do know of early Pictish times in Scotland comes from anecdotal evidence from outside sources (mostly Roman and Norse). Pict means “painted people” and probably referred to the Pictish custom of tattooing their bodies or painting themselves with war paint. Pictish society was a group of federations, each with its own leader or king. The Picts were farmers and hunters, as well as quite well regarded horsemen. They hunted both with dogs and falcons. And most obviously, they were great craftsmen and artists. One standing stone has three deeply incised Pictish symbols on one face: the serpent, the double disc and Z-rod and the mirror and comb. The meaning of these symbols is unknown. The other face of the stone exhibits prehistoric cup marks, showing that it has been re-used. 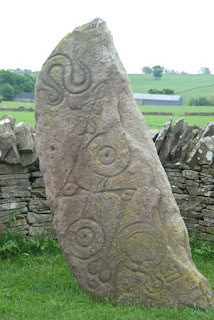 This stone is known as Aberlemno I. 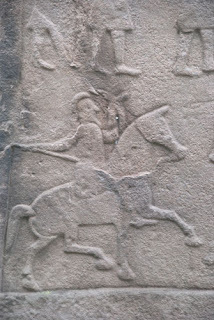 Another stone shows a Celtic Cross on one side, and a battle scene on the reverse. 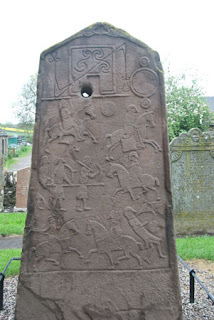 The Kirkyard Stone is inscribed with a Celtic Cross flanked by patterns on one side and a battle scene on the other, reputedly depicting the Battle of Dunnichen. A hole was bored through the upper part of the stone some time after its sculpting. We drove out through moorland and over sheep filled hills toward Pitlochry. Traveler Two watered the heather, so to speak, while I stood outside the car and listened to lambs baaing plaintively to each other and the desolate cries of curlews calling in the distance.